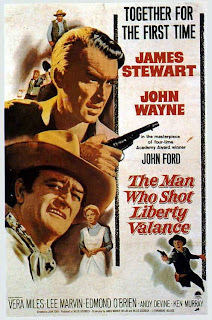 Tag line: "Together For The First Time - James Stewart - John Wayne - in the masterpiece of four-time Academy Award winner John Ford"
Before Gene Pitney turned it into a hit song that reached #4 on the Billboard chart in 1962, The Man Who Shot Liberty Valance was a top-notch western directed by John Ford. Starring John Wayne, James Stewart, and Lee Marvin, The Man Who Shot Liberty Valance presents a less glamorous side of the American West, where heroes were sometimes forced to compromise their principles in order to survive. Rance Stoddard (Stewart) is an East Coast lawyer heading out west, hoping to bring a little law and order to a lawless frontier. Before reaching his destination, however, the stagecoach he's riding in is held up by Liberty Valance (Marvin) and his gang. For trying to protect one of the female passengers, Rance is beaten senseless by Liberty and left for dead. Fortunately, Tom Doniphan (Wayne) happens by the scene, and takes Rance to the town of Shinbone, where he recovers from his beating in the home of Pete and Nora Ericson (John Qualen and Jeanette Nolan), which also doubles as the town’s only restaurant. Hallie (Vera Miles), who works there as a waitress, nurses Rance back to health, and Rance vows to use every means possible under the law to put Liberty Valance behind bars. Tom does his best to convince Rance that the law doesn’t yet exist in this part of the west, and the only thing a man can rely on is a gun in his hand. It's a lesson Rance learns all too quickly once Liberty Valance challenges him to a showdown. The Man Who Shot Liberty Valance boasts one great scene after another, yet my absolute favorite is a sequence that enhances the personal intensity of each of the film's three main characters. It takes place in the restaurant, where Rance, who is still recovering, agrees to help out by waiting on tables. Liberty Valance comes wandering into the dining room, steals a table for himself and his men, and as Rance is bringing a plate of food to Tom, Liberty sticks his foot out and trips him, sending Tom’s steak dinner spilling onto the floor. As Liberty and his boys are laughing it up, Tom stands and says, “That was my steak, Valance. Pick it up”. Liberty, who immediately stops laughing, stands and faces Tom, preparing himself for the obvious showdown about to take place. Just then, the always-sensible Rance angrily intervenes, chastising both men for their willingness to kill each other over a simple steak dinner. He settles the dispute by cleaning up the mess himself. This is a tremendously tense scene, one played to perfection by the three leads, and establishing, in one fell swoop, Rance's respect for law and order, Tom's strength, and the volatile, violent nature of Liberty Valance. The Man Who Shot Liberty Valance is a three-way battle of wills, and not one of these men is going to back down from it. The Man Who Shot Liberty Valance is second only to The Searchers as my favorite John Ford western. Presenting an intriguing conflict between the law of the land and the power of a gun, The Man Who Shot Liberty Valance reminds us of a time when the American West was still in its infancy, and both a law book and a handy sidearm proved to be of equal importance. The striking thing is also how good it is despite the things which could have been against it. It was shot on the back lot, so there are no incredible, perfectly-framed shots of Monument Valley. Both Wayne and Stewart were far too old for the roles they are playing. But it doesn't matter, because the actors and the writing (and the thoughts behind the writing) are so good. In fact, it was better for being shot on the back lot, since the unreality of depictions of the Old West is a big part of the point. I read somewhere that Ford set out to make a "change of pace" western, a break from his location-heavy/Monument Valley films of the past, and both Stewart and Wayne were, I believe, in their 50's. Yet as you say, it works in the film's favor, tearing down the artifice one would normally expect to find in this type of western. Ford's career arc is certainly a fascinating one: from helping to define the genre with STAGECOACH to the darker views expressed in THE SEARCHERS, right through to this film. Not sure which is more appropriate: that John Ford's take on western mythos was influenced by the changing times, or if, because he WAS John Ford, his ever-evolving view of the west is what "changed the times" (from a cinematic standpoint, anyway) in the first place! Like you, "The Searchers" is my favorite John Ford Western. For some reason, I like "The Man Who Shot Liberty Valance," but I never like it as much as I think I should. It's a very good movie, but I do not rank it so high on my list of Westerns as many do. I like the theme of the movie, I love the idea of pairing John Wayne and Jimmy Stewart, and I love John Ford's movies. But for me, the sum does not match my expectations when you put all the parts together. But it is still an excellent film. @Chimesfreedom-Pophistory: Understandable. Even when it was released, VALANCE was considered a "lesser" John Ford film. Still, I admire the movie for its story, and I love the conflict it presents (i.e. Wayne helping out Stewart's character b/c it's the right thing to do, even though he knows it'll screw up his plans and, eventually, his life, Stewart abandoning his principles to face off against Liberty Valance, etc). This is a case where they cast this film completely wrong for the starring roles and came out with a great movie. If you ever read the story, the two leads (Stoddard and Donaphin) are very young men when the action all takes place. Instead, the producers cast two aging stars in the roles. If you're a fan of the story, it's almost comical. But if all you've ever seen is the movie...it's still a wonderful film. Not least of all because of the trio of villains: Lee Marvin, Strother Martin, and Lee Van Cleef--damn, what a bunch.